April 30, 2015 In News What is Michelle doing now? 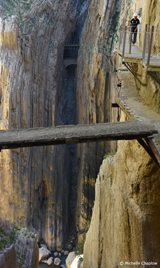 The Camino del Rey in El Chorro, Andalucia. Being a photographer is such a great job, in that it takes you to all kinds of weird and wonderful places. As Andalucía showed signs of spring, Michelle embarked on what has been called “The scariest walk on earth”. 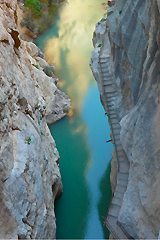 Enjoy some of Andalucía’s most spectacular scenery close-up in her photo blog of the newly reopened Caminito del Rey, the King’s Little Path, in Malaga province. High up above El Chorro gorge, the Camino is not a difficult walk, but not it’s for the faint-hearted or those with vertigo – as you can see from these photographs. A view from the Camino del Rey of the dramatic cliffs that surround it. The luxurious Rockcliffe Hall in County Durham. Michelle enjoyed a short break at Rockliffe Hall in her home county. With its quintessentially British doorman and concierge, dressed in grey morning suits and bowler hats, offering an encyclopaedic knowledge of the area, the world-class spa, and championship golf course, this is one of northern England’s most luxurious establishments. Alejandro Matrín Parra and David Villalba admiring the work on show at Casa Sostoa, Malaga. This is the private home of Pedro Alarcón, a space where artists are invited to showcase their work in a 1960s apartment in Malaga. The lounge, the bedroom and the entrance all display contemporary art, co-habiting with Pedro’s personal processions in his space. Since Casa Sostoa opened its doors in 2013, numerous exhibitions have taken place in the comfort of Pedro´s home, and his own kitchen is the perfect place for art, exchanging ideas, and grapevine gossip, doubling up as a cocktail and aperitif venue, all with modern design and flair. 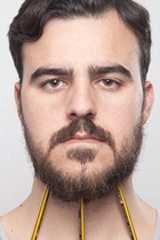 The current exhibition is titled “the faces book” and is series of portraits and self-portraits. David Montosa shows his series of childhood and adolescence-themed self-portraits: Extraescolar. David Montosa alongside his project. Joan Lara presents his photographic project: Ver, que no mirar. Self-portraits where the eyes of the subject – the windows to the soul – have been rubbed out in the photo. The work ofJoan Lara and the Casa Sostoa sofa. 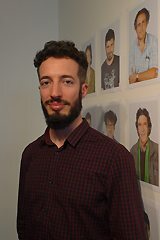 Alejandro Martín Parra’s Híbrido collection portrays artistic movements in Malaga. A unique space which is well worth visiting,Casa Sostoa is situated at Calle Héroe de Sostoa 142. Processions passing through Seville during Semana Santa. The last time that Michelle visited Seville for Semana Santa (Holy Week) was way back in the days of slide film. Never has she seen so many Nazarenes (the robed figures wearing tall, pointed hats) – over 2000 in some of the processions. Michelle was lucky enough to photograph La Estrella procession on Palm Sunday, thanks to a tip from a local. The crowded Puente de Triana in Seville – a spectacular sight. The procession crossed Triana bridge to head to the cathedral, and Michelle had a bird’s eye view from the open air terrace at the Faro de Triana restaurant, overlooking the bridge. Incredibly emotional moments, age-old traditions – it was magical to experience the whole event first hand. A ´tronco´ of the Virgin Mary passes through the crowds on the Puente de Triana. 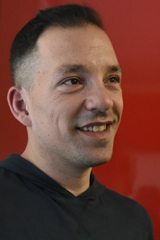 On 17 April 1996 Andalucia.com was born – founded by Chris Chaplow. A labour of love and dedication to this beautiful region of Southern Spain, Andalucía.com has established itself as the leading website about the region, with visitor statistics which have grown exponentially. Southern Spain is a consistently popular destination for English-speaking visitors, and when they want reliable, comprehensive information, Andalucia.com is the go-to website. The website moves into it’s 20th year. Old meets new at the Camino del Rey, El Chorro. Two brave Spaniards walking the ´scariest walk on earth´. A birds-eye view from the Camino del Rey. 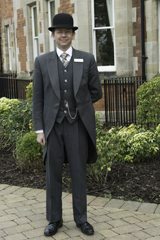 A thoroughly British doorman at Rockcliffe Hall in County Durham. 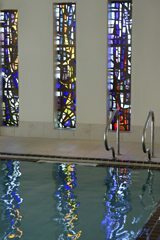 The beautiful spa at Rockcliffe Hall. Pedro Alarcón, the proud owner of Casa Sostoa. A piece from Arturo Comas - absurd and surrealist portraits. Alejandro Martín Parra - Híbrido collection.